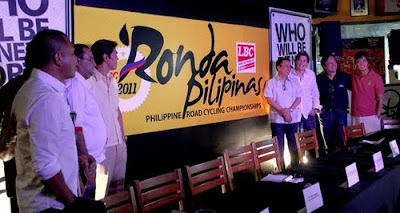 In an effort to look for new sports heroes in the field of cycling, leading courier company LBC, in collaboration with the Philippine Cycling Federation, on Wednesday launched “Ronda Pilipinas,” a 20-day cycling competition to be held in September to October this year. “Ronda Pilipinas 2011” which is sanctioned by the Union Cycliste Internationale, offers a total of as much as P7 million in cash prizes. The individual champion and team champion will get to win P1 million each. The route will cover at least 1,650 kilometers Philippine roads including selected tourism destinations across the country. The race is also foreseen to serve as the final tune-up cycling event for future SouthEast Asian Games. Qualifying regional races, reports say, were scheduled in May to determine the composition of the 12 teams that would compete in the race, with each team to comprise at least six cyclists. Reportedly, the championship will start in Cagayan de Oro City towards Bukidnon for the Mindanao leg; to be followed by a Dumaguete to Bacolod leg, and the third circuit will be from Roxas to Aklan before going to Luzon for the rest of the tour.